Rod Load Dia." Length" Wheel "
2058S 5/8" Rod x 2-3/8" Tubing 19,600 1.5 27 1.83 10 lbs. 2034S 3/4" Rod x 2-3/8" Tubing 19,600 1.5 27 1.83 10 lbs. 2558S 5/8" Rod x 2-3/8" Tubing 19,600 1.5 27 2.25 10 lbs. 2 oz. 2534S 3/4" Rod x 2-7/8" Tubing 19,600 1.5 27 2.25 10 lbs. 2578S 7/8" Rod x 2-7/8" Tubing 22,400 1.625 27 2.25 11 lbs. 5 oz. 2510S 1" Rod x 2-7/8" Tubing 32,500 2 28.5 2.25 18 lbs. 2 ox. 3078S 7/8" Rod x 3-1/2" Tubing 22,400 1.625 28.5 2.75 15 lbs. 3010S 1" Rod x 3-1/2" Tubing 32,500 2 28.5 2.75 19 lbs. 30118S 1-1/8" Rod x 3-1/2" Tubing 49,000 2.25 28.5 2.75 22 lbs. 2058H 5/8" Rod x 2-3/8" Tubing 19,600 1.5 27 1.83 10 lbs. 2034H 3/4" Rod x 2-3/8" Tubing 26,000 1.5 27 1.83 10 lbs. 2558H 5/8" Rod x 2-3/8" Tubing 26,000 1.5 27 2.25 10 lbs. 2 oz. 2534H 3/4" Rod x 2-7/8" Tubing 26,000 1.5 27 2.25 10 lbs. 2578H 7/8" Rod x 2-7/8" Tubing 31,000 1.625 27 2.25 11 lbs. 5 oz. 3034H 3/4" Rod x 3-1/2" Tubing 26,000 1.5 28.5 2.75 12 lbs. 6oz. 3078H 7/8" Rod x 3-1/2" Tubing 31,000 1.625 28.5 2.75 15 lbs. 3010H 1" Rod x 3-1/2" Tubing 42,000 2 28.5 2.75 19 lbs. 4010H 1" Rod x 4-1/2" Tubing 42,000 2.25 33.5 2.75 25 lbs. 40118H 1-1/8" Rod x 4-1/2" Tubing 47,000 2.25 33.5 2.75 25 lbs. 50118H 1-1/8" Rod x 5-1/2" Tubing 47,000 2.25 36 2.75 28 lbs. 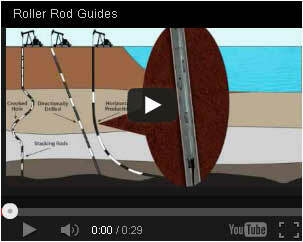 Standard Models are for applications in well bores where temperatures do not exceed 180 deg. F, with standard UHMW polyethylene rollers. For service in higher temperatures, see special wheels listed on back side of this sheet. Standard models are designed for application with these listed Rod Limits. For applications in excess of these limits, consult Roller Rod Guides LLC .Roller Rod Guides LLC does not express or imply any warranties of its roller rod guides , either with regard to these rod load limits or in any other manner.